Korres Greek Yoghurt Sleeping Mask Review (2018): Does It Really Work? KORRES Greek Yoghurt Sleeping Facial, US $46 for 40 ml jar, is an overnight leave-on moisture boosting mask that promises to significantly flood your skin with precious hydration to relieve it from tiredness and dullness. KORREs positions itself as a brand with conscience.The company claims that it only formulates and circulates skin care and personal care products that carry safe ingredients. The brand traces its roots to Greek tradition, and its innovative formulas are influenced by centuries old traditions involving Greek homeopathic medicine. This product revitalizes your skin by restoring its optimal levels of moisture, proteins, and other nutrients that your skin needs to speed up repair and renewal processes. It also enhances your skin’s natural healing process, relieving it of inflammation, chronic dryness, and damage while simultaneously building up your skin’s resilience to better fight off future damage. This product is made with 100 per cent all-natural ingredients and is suitable for use by those who are following a vegetarian lifestyle. This product do not contain petrolatum, mineral oil, silicones, parabens, propylene glycol, and ethanolamines. Based on the results of a consumer testing study published by the company on the official product website, 97 per cent of women claimed that their skin felt and appeared smoother the morning after their first product application. This product contains alcohol and several fragrance ingredients that does not make this product ideal for use on sensitive skin. KORRES Greek Yoghurt Sleeping Facial reviews posted by users who claim they have sensitive skin highlighting how this product may cause skin irritations are common. 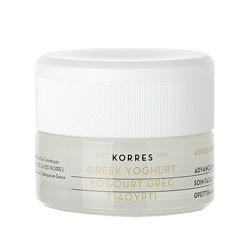 KORRES Greek Yoghurt Sleeping Facial must be applied on the skin after cleansing and toning. Leave on overnight to rinse the following morning. KORRES Greek Yoghurt Sleeping Facial makes plenty of very bold claims about what yogurt can do, which makes this product special, according to its marketing lingo. Sadly, KORRES isn’t as fast when it comes to providing proof for its claims. We are not keen with the ingredients in the formula that are well-known to damage the skin. We can only hope that the company might want to live up more to its proclaimed brand identity next time and create better products that are consistent with its stated mission.